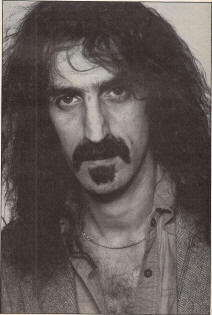 Frank Zappa has been involved with recording as an artist, engineer and a producer since the early sixties. Zappa is known as a recording and musical innovator with a somewhat unorthodox manner, and first came to the greater public's attention through the work of his group "The Mothers of Invention." This interview was done in the studio while Zappa was recording his upcoming album, Läther, and begins with discussion of Paul Buff – creator of several recording products issued under the aegis of Allison Research – who was a major influence on Frank Zappa's early recording career. As you'll see, from that point on, it was definitely Zappa's trip. MR: Since we know you and Paul Buff worked together for a while in the old days, would you tell us about this relationship? FZ: I met Paul when he had a studio in Cucamonga, California. The equipment was very basic, most of it was homemade. He had learned his electronic skills in the Marine Corps and he came out here to decide if he wanted to go into the record business. He taught himself how to play sax, piano, bass, guitar and drums. He also taught himself how to sing, and built the studio so he could record himself, or any of the local bands who were in town at that time. He only charged about $30 per hour. Two surfin' hits, "Pipeline" and "[Wipe Out]," were recorded there and the master was leased to either Dot or to another record company. Most of my basic training in recording came from working with Paul. I started playing on some of the demos that he was cutting there at the studio and got interested in the equipment. When we would have dinner at the bowling alley we used to eat at, he would draw diagrams on the napkins of how the equalizer worked. He gave me a lot of basic information on how things work and even in 1963 he was working on developing some of the inventions which are on the market today, through Allison Research. I think not too long after 1963 he built the prototype of the Gain Brain, and the first Fuzz Tone that I ever saw, by overdriving a phonograph pre-amp. He built his own equalizers for his little console that we had there at Cucamonga. He also built a five-track tape recorder with staggered heads because they didn't have inline heads. 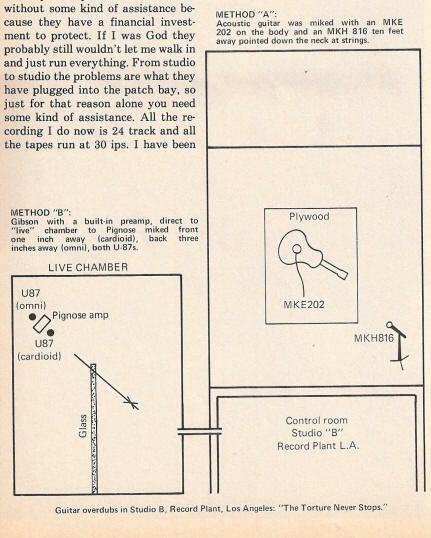 The record head was also the playback head and the machine had its own erase head and we used half-inch tape. The other equipment in the studio consisted of about five or six Shure microphones, and a homemade condenser mic. We had two pianos, a Steinway upright and some type of Baby Grand. I can't remember the monitor system in the control room but I gathered there were a few Hi-Fi speakers from the boxes I saw. It was basic and good enough for rock and roll. We could overdub on that machine and could ping-pong on it. Allison, the girl whose picture is on the Kepex, used to be the waitress at Cucamonga Moltra [we'll assume the Moltra was/is a local restaurant]. Paul met her and fell in love and they moved into a trailer together. He produced a bunch of records where Allison sings. She is a very good singer and has a nice voice so she did a lot of recording out there at Cucamonga, but I don't know if she has recorded since then. I think Paul is definitely one of the pioneers of the modern multi-track recording industry. He's a genius. MR: Were there any other people who influenced you as a producer or engineer? FZ: No. What happened was that I eventually bought the studio from Paul, so after he drew the diagrams on the napkins, everything else I learned was just from making mistakes on my own. I had that studio for about nine months, 11 or 12 hours per day to just record. MR: Do you have any favorite studio at the moment? FZ: I like Caribou, except for the fact it is 8000 feet up. If it was at sea level it would be a fantastic studio for my purposes, but so many funny things have happened to people and musical instruments when the air is so thin. The distance between the air molecules affects the sound of the instruments and the acoustics, and also creates other problems for monitoring. Right now I think my favorite studio is Kendun, because of the way it's laid out and the equipment. I like the idea that you can cut right away so you can keep track of your progress. Unfortunately, the disc-cutting facilities over there are booked up so much. However, it is an ideal situation – you have disc-cutting facilities while you are working on a project. A lot of people when making an album forget how it's going to be in the end, which is on a piece of plastic in somebody's home. So it can be very deceptive when you are working on a project two or three months only hearing it over the big monitors which are coming up from the tape with a dynamic range. So it's nice to keep tracking to make reference during the project. It would be great to make a direct-to-disc recording. I think that would be a good way to record jazz or classical music. You get a good string quartet and bring them in and put them in direct-to-disc. It would be perfect because they usually know exactly what they are doing before they start up. MR: Let's suppose you are the only engineer in a totally unfamiliar studio where they have every piece of hardware ever made; what would you start with? FZ: First of all, if I'm going to a studio which is completely unfamiliar, they won't just turn it over to me without some kind of assistance because they have a financial investment to protect. If I was God they probably still wouldn't let me walk in and just run everything. From studio to studio the problems are what they have plugged into the patch bay, so just for that reason alone you need some kind of assistance. All the recording I do now is 24 track and all the tapes run at 30 ips. I have been recording everything with Dolby but I think that the new Telefunken system is much better. As far as microphones go, I have different favorites for different instruments. I use U-87s, Sony C-37s, AKG 414s. I like to use shotgun mics for the piano to get certain types of effects. For kick drum I like an RE20 or two U-47s. It depends on what style the drummer has, whether he uses heavy footwork, or is a studio-trained drummer that plays light and gets that "fat" sound. You have to suit the microphones not only to the instrument that you're recording, but also to the way in which the musician plays the instrument. MR: When you are recording is the bass an amplified channel, or miked? FZ: I usually take the bass direct – very solid master amplification on the bass. If you want to get an amplified sound you can always play it back to the cue system and the little amp [a Pignose Inds. amp] when you are mixing. It saves you an extra channel during the recording. That's the decision you have to make right there on the spot. If you lock yourself into the proportions of mics versus direct you may regret it later, so it is better to go on with direct, getting a little compression on it so that it sustains the right level all over and if you want to get more rock sound on it, just play through an amp. Play back to the Pignose, when you are mixing. MR: Do you try to make a record as good as the one before or do you try something different everytime? FZ: I am trying something different everytime, because everytime I go to the studio and spend that money for studio time it is not only the opportunity to make another album but it's an opportunity to experiment with all the new things that have come out that year. MR: For this latest album, were there any tunes actually written in the studio? FZ: Most recently, everything has been prepared before we go to the studio. MR: After seeing the huge tape library in your house, I'd like to know if you record every concert on the road? FZ: What we normally do is tour about six months out of the year and I take a four-track machine and just record about every show that we're doing. Even if it's the same song. So if we play 100 concerts in a year, that's 100 takes which is a better average than what you would get in the studio. So we come up with some very good things that way. I also like recording different parts of the four-track in different kinds of environments. For example, we take a "live" track and get a lot of drive from a rock performance where the audience's enthusiasm is there. It's possible, if you are miking right, that you will never even know that it was a "live" track because you won't hear the audience. If you're taking care during recording you'll come up with a basic track that's got more power and spontaneity than you are going to get in the studio. So bring that back to the studio and do your vocals under studio conditions or add any sweeteners or electronic effects and you've made a hybrid kind of an album where the drive is there but the sound quality is better. MR: Which remote truck do you most frequently use? FZ: I've used many different remote trucks, the most recent one was from Manor in London. In Los Angeles we've used the Wally Heider truck, which is very good, and we've also used the Record Plant truck. On the East Coast we've used FEDCO. MR: Could you describe some of the problems that have occurred during "live" recording? FZ: The first problem that we have is finding all the groundloops. You can be chasing those for hours. Another thing that you have to do if you're on stage, playing – it means you can't be in the truck – is to put a lot of confidence in the engineer. Hopefully, he can get the right sound. The basic problem for a remote truck is the monitoring system. Some guys may monitor through 4311s. It makes you scared, because the JBL 4311s are not the ideal speakers to mix through. You may come back with a tape without top end and too much bottom or vice versa. MR: Are the things you were doing in the old days at the studio radically different from what you do now? FZ: When I first started recording every place in town was four track. By the time my third album came around they were just getting into eight track. It was in New York about the fourth album they were using twelve track, and about the fifth and sixth album, sixteen track was coming into existence, and later twenty-four track. The things that you had to do in the studio in the old days versus the things you have to do today are vastly different. Some techniques don't change, and some change very radically. One thing that I'm really insistent about is making sure that there is a tune-up tone on the head of the first reel of the multi-track master. That way, for overdubs, you can always tune up by recording an 8440 cycle reference tone using the fix pitch instrument of your group. For instance, Fender Rhodes or Hammond organ, or in our case it would be marimba. You record that "A" on tape and everyday before you overdub, you tune your strobe tuner to that "A" and everybody stays in tune with it. I think it's very useful to take time to print that "A." MR: Could you mention some of your favorite studio hardware? FZ: My favorite limiter is the dbx stereo limiter. If you want to mash large portions of the track, you can use the dbxs for individual instruments. I like the UREI LA-3As and the Burwen Dynamic noise filter. I also like the Neumann stereo expander or the one by Neve. I have an outboard rack so we go on the road with: 1 dbx stereo limiter; 2 LA-3As; 1 Spectra Sonics limiter; 6 White graphics and a White third-octave spectrum analyzer; 2 Gain Brains; and 2 Kepexes. That's our basic outboard gear just for doing a concert. For studio the basic set up would be: one 24-track; one 4-track delay; two 2-tracks; one Harmonizer; and four dbxs. MR: What do you want to accomplish or avoid when making an album? FZ: You learn the hard way. On most of the early albums I made I think the EQ was bad. I think there was hardly enough on top and there were a lot of things wrong, but they were being made with the equipment which was the best you could get at the time. By listening to those things now I can learn from those mistakes, hearing it back and finding out how to change it. Another thing a person has to know if he wants to have control of his composition is not only to understand what's happening in the studio with the studio equipment but also to find out about disc cutting. You can know all about getting your tones right on the tape recorder and getting the azimuth right, making sure everything is at the right levels and eventually come up with this fantastic tape, but if you're not careful when you put it onto a disc, it is still going to sound horrible and you won't know what went wrong. So you have to go to the disc-cutting place where they are putting your music on record. MR: Let's say you now have a great master disc, don't you still have to watch how they are going to press it? FZ: You are absolutely right. You can never be 100%. Even if you sit there all the way through the pressings, personally play each one to see if it is perfect, place each one in the wrapper and box, make sure they didn't warp and then make sure they got to the store right. Then the biggest problem of all happens because you will never know what kind of machine it's going to be played on. So you can't be completely sure what's happening, but if you aren't as careful as you can be all the way, you are really in trouble. MR: Who is your favorite mastering engineer? FZ: I use John Golden at Kendun. The last album was done at Amigo with Arnie Acosta, because I couldn't get into Kendun, but I think Arnie did a fantastic job on it. Arnie also mastered two of the earlier albums: Grand Wazoo and Waka Jawaka. MR: How would you design an album in terms of level and time? FZ: One of the things you have to think about when you are sequencing an album is what kind of song you're going to end each side with because the tone quality is going to suffer on that song. It's always better to go with something that is softer as the last song on each side, because if you want to save your hottest number until the last cut on an album, it's not going to sound as loud. It's hard to keep the level if the side goes over 18 minutes. I'm trying to put the most powerful cuts on the outside of the groove so I have all the top and bottom left, but sometimes I can't do that. MR: Did you use any special effects on your upcoming album, Läther? FZ: We used a Harmonizer on the bass. The "live" portion of the album was done partly in London and partly in New York. So where we have Harmonizer on bass, it was split left and right, which gave us a real nice sound on the bass. It's a different sound and a difficult sound to get on disc, because of the phasing problem. The Harmonizer is used on the guitar quite a bit and I'm using the MXR flanger on a few of the guitar sounds. There are also a number of overdub guitar solos on that album that we have done with just a Pignose amplifier. In fact, I have used a Pignose extensively on the last five albums. It's a very reliable sound source for the studio. It takes very little time to set up and you know what the tone is going to be. We've put the Pignose in a "live" chamber to simulate "live" sound and to get a really large sound. Instead of just mixing it and sending the mic signal into the echo chamber, you can get a completely different effect by actually having the amplifier in the chamber, and sending the guitar through the echo send into the Pignose and picking it up with the microphone in the chamber room. MR: Listening to your albums I get a feeling of strong positioning [in the stereo spectrum]. How do you avoid leakage from channel to channel? FZ: Lots of times if they set the crossover on the disc cutter at too high frequencies, the result will almost be like mono. So you try to avoid using high frequencies as much as possible. This helps your stereo spread. I have recorded drums two different ways. Most of the drums' actions are from tom-tom passes. If you record each tom-tom mic individually, instead of an artificial panning situation you'll get a certain type of movement. In some songs that movement can be a little bit too harsh, so I use a C-24 overhead and I'll get natural stereo spread. One way that you can give the illusion of the stereo spread being wider than it actually is is to set it [the spread] up at the intro of a song. I'm going to try this, by the way. On my next album the drums have a certain type of stereo action throughout. You set them in the middle of the spectrum and if the guy [drummer] is going to cross, the tom-tom is still going to pan. As soon as the rest of the band comes in, you can do other things, like setting them a little bit further out from the mid. Then when everything comes in full blast, you bring in two pieces of information – like mono tracks – exactly left and right, and then for a period the whole stereo spectrum just spreads out. Another way to make things sound wider than they are is by taking an instrument like the marimba, a scale-type source – physically a long instrument – and putting two C-37s looking down, as far as you can, to cover the instrument's keyboard. When the musician plays most of the information right underneath the mics, all he's got is one note on the top and one note on the bottom and suddenly you find out how big that instrument is. And it's a really great effect. A very nice effect I've used that won't be coming out until the next album is to have vibes and marimba – a mono track of each – playing notes that are rolled, put the tracks just slightly in from left to right and double each of those tracks. There are some mono tracks of woodblocks playing the melody, so the wood blocks match up exactly on each stroke of the vibes and marimba and give us a rattling texture that's great, especially in earphones. It's fantastic. MR: During mixing, for playback, do you use the reference tones exactly as they naturally exist, or do you change the top and the low ends? FZ: One thing that I've been discovering since I've got the new Ampex tape recorder is how much difference there is in the quality of the playback – as far as playing around with the recording reference tones. For example, people usually set the tape up to the tones exactly right and then what they do is play with the equalizers in order to get some top end out of it. However, if you take your top end reference tones and set them 2 dB hotter it's fantastic. You let the machine work for you and you don't have to incorporate the additional noise of any outboard EQ in order to get that extra brilliance. Although, some of that eventually is going to be buffed away when they make the disc. You might even tweak the low end a half dB, and leave the middle where it is.